Unexpected Homeschool: Bring on Christmas! We are officially on Christmas break! That feels so good to write. It's been a long semester and we all need an extended vacation to recharge for next semester. Amber did indeed finish her Analytical Grammar season one lessons. Next semester she will only have one day of grammar review every other week. This is a new schedule for us as we are accustomed to having grammar every week all year long. Instead of grammar we will use that time to focus on poetry, creative writing, and a little expository writing. According to my homeschool tracking software, Amber has also earned 301 core hours this semester. She made it to the halfway point for the year and we won't start second semester already behind. This is a huge accomplishment and a big weight off my mind. One thing that was not completed was Amber's illuminated page project. You'll understand why in a few paragraphs, but we decided to work on it over our break as a fun family project. Yesterday, Amber's teen drama class performed their Christmas pantomime for our homeschool group during the lunch break. It was the first time Amber had been in a pantomime and I thought they all did well. Amber was Mary, of course. At least this time she didn't have a singing solo like the last time she played Mary. 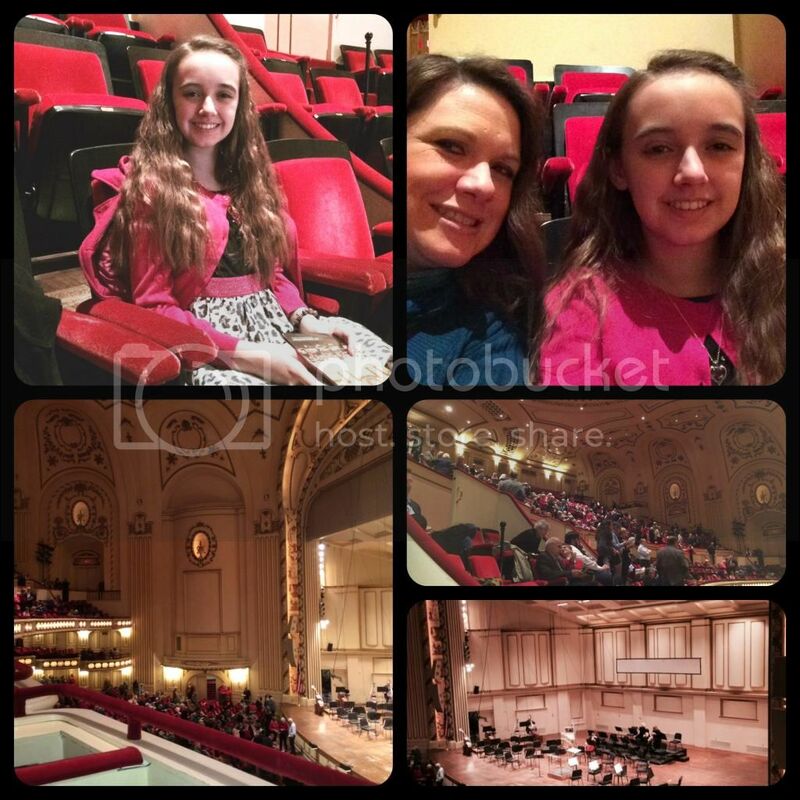 Symphony last friday at Powell Symphony Hall. It was Vivaldi's Four Seasons. This morning our homeschool group attended a performance of A Christmas Carol at the Fox Theater in St. Louis. We seem to be making quite a few trips to that area lately considering The Fox is across the street from Powell Symphony Hall. At least this week the weather was much nicer than the 24-hour downpour we dealt with to attend the symphony last week. Last week, while on our way into Powell, Amber noticed an advertisement up at The Fox for Phantom of the Opera coming in March. Do you see where this is going? Fred and I saw Phantom years ago, even at the Fox Theater, however Amber has only been able to watch it on TV. Phantom of the Opera is one of the few Broadway productions that Fred is actually willing to see, so of course we all now have tickets for March. 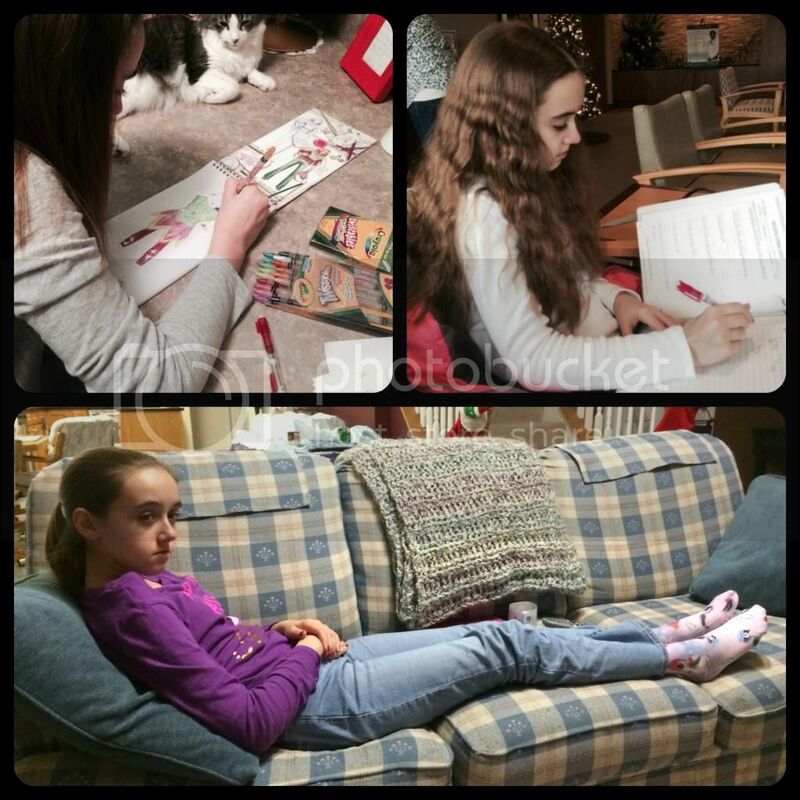 This week there was also one doctor's appointment scheduled: Amber's neurology follow up. Sadly it didn't end with just that one appointment though. Amber has been feeling quite poorly for over a week now. 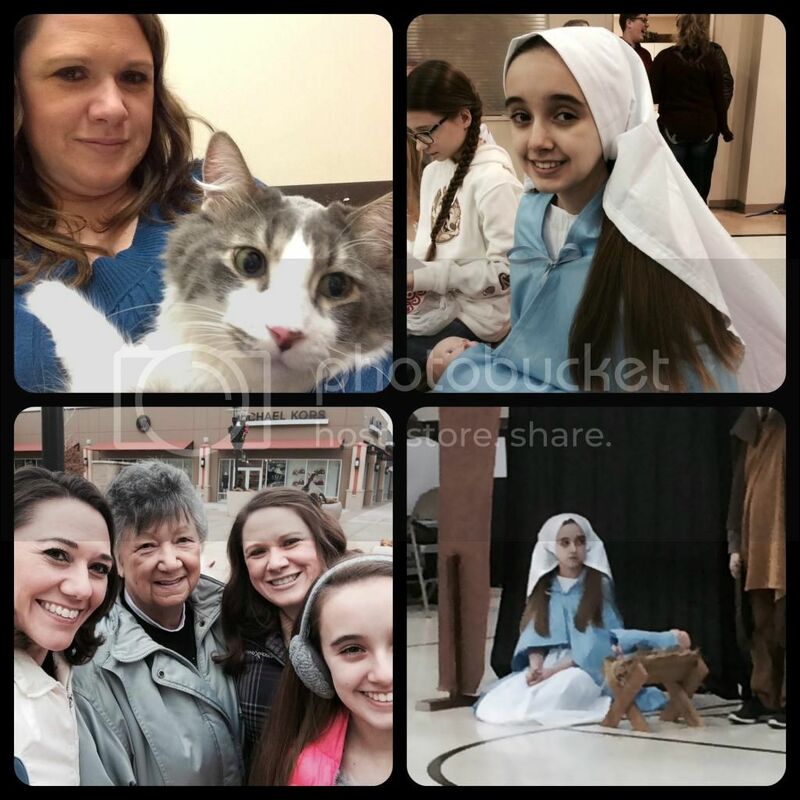 Last Sunday she had a pre-syncope episode during music rehearsal for the church Christmas program. It was scary and I was terrified that she was going to collapse prior to us getting her out of the group of kids. Amber was completely unaware of her surroundings and unable to interact with us. Thankfully, we got her straightened out, but the pre-syncope episodes are considered the same, medically, as a syncope episode where she would fully lose consciousness. (Right) Amber as Mary in the homeschool co-op Christmas pantomime. It is her drama class. (Left) Milori and me at the vet. He's not doing so hot lately. (Left-bottom) Our family. The neurologist was not happy with how low Amber's blood pressure has remained despite fluids and a dramatic salt increase. Not to mention the huge drop in blood pressure anytime she is upright. So, the neurologist put her on medication to raise her blood pressure. Unfortunately, she can't take medication to lower her heart rate because the super fast heart rate (160+ when upright) is the only thing keeping her blood pressure from bottoming out all the time. We will see how the medication works. She may get a second medication if this doesn't help enough. The neurologist also put her on a medication to reduce the migraines and help her be more comfortable. I know this medication well; I was on it for 4+ years for chronic daily migraines before weaning from it earlier this year. The blood test for AAG still is not back yet, but we didn't honestly expect results this early. The neurologist did discuss how Amber's other autonomic test results all indicate an autoimmune disease as the root cause of her medical problems. All of the results. Every last one. At least we know what kind of beast we are dealing with. Now to determine exactly which one. Oh AAG test results, we need you now. Unfortunately, the neurologist noticed some additional symptoms of concern while we were in his office. He called Amber's other specialists from the exam room with us present, but didn't get the answers he wanted and thus Amber had a rushed appointment that very afternoon with her endocrinologist. Autoimmune diseases can damage the adrenal glands and Amber shows possible signs of Addison's disease. It would be from damage done by her still-unnamed-autoimmune disease and not the cause of her dysautonomia. As a result, Wednesday morning we were getting Amber's blood drawn to test her cortisol levels and antiadrenal antibodies. Of course, that test won't be back for another two weeks. Because that's what we needed, more secondary conditions. This weekend Amber is again playing her flute to accompany the Vocal Fusion choir on one song and also playing a solo during a Christmas performance at a retirement community four minutes from our house. Originally, she had other commitments at church too, but after her pre-syncope episode last Sunday we have removed her from those performances. She can at least sit while playing the flute and her entire performance time is, at most, 10 minutes compared to the hour long Christmas program at church that is all standing. (Top-left) Tinkerbell inspired drawing projects. (Top-right) Grammar at the neurologist. (Bottom) Feet up and compression socks on. Her blood pressure was low and circulation was poor. I'm so thankful that we have the ability to tailor Amber's education to fit her health. This week, while difficult, also showed us that we are doing a good job balancing Amber's school and activities. She finished half of her required hours in half of a school year while still having time for favorite activities, friends, doctors, and rest. This has been a productive semester despite what feels like slow academic weeks. I'm sure we will tweak her schedule a small amount next semester, but I think we finally have a rhythm that fits Amber's current needs. Next week we have some fun family Christmas traditions scheduled, a couple of days of rest at home, a party and the last co-op classes for the semester. Bring it on! I came across a Phantom of the Opera video thanks to the teenage daughters of friends of ours. http://youtu.be/TCL94-MsxYc It is quite cool. I described it to my university friends as Phantom with a Rocky Horror Picture Show vibe. Two of their favorite things. As always Amber is in our prayers. What a hard and scary week medically. I hope the answers come in soon. I know it is frustrating. The rest of the week looks fantastic. I love the Phantom of the Opera. I saw it years ago. It's hard to find a good balance of school and life, so I applaud you especially with all the doctor appointments you keep having. I LOVE Phantom of the Opera, I got to see it with my husband when we were on our honeymoon, so it's got a special place in my heart. I do hope you have some answers soon. I think the both of you are dealing with the health issues with great courage and fortitude! Amber achieves more than most children of her age. I'm not sure my last comment worked Sorry if you get two! I'm so sorry to hear that Amber had a health scare this week. And now with this possible new diagnosis added to everything else you guys must be feeling so discouraged. I think considering everything, as hard as it must have been, you made some wise decisions in cutting out some activities. I do think that going to see Phantom will help cheer you all up a little bit though! My son and his wife live in NYC. A few years ago they treated Rachel and Rebekah to a Phantom performance on Broadway. It was a thrilling experience for them. They still talk about how awesome it was. Here's hoping that you guys have a much better week this week!